The past few years The Nesting Place has hosted a fun series called 31 Days during the month of October. It is such a fun series and I love the challenge. 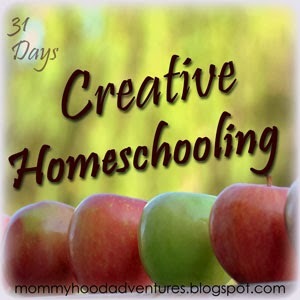 This year I am learning how to homeschool more creatively. It's a whole new ballgame for this momma with a high-schooler, a junior-higher, a 6th grader and a 2nd grader. I am learning how to teach everyone to their fullest potential while keeping my sanity. Day 2 ~ I Heart the Library - The library is not only a spectacular place to get books. Day 3 ~ Letting Go of the List - Learning to let go of my plans so the kids can pursue theirs. Day 4 ~ Writing it All Down - You will be amazed at how much they learn when you aren't teaching them. Day 5 ~ Extracting Colors From Leaves - A very fun fall science experiment that almost any age can do. Day 6 ~ Bible Memory - Romans 12:10 Thinking about missed opportunities at showing honor. Day 7 ~ Volcanoes on Sunday - How Little G made her volcano. Day 8 ~ Apple Unit - A link list of resources for an unit on apples for more than just preschoolers. Day 10 ~ Knowing When to Take a Break - We all need to take a break sometime. Knowing when to time them is the hard part. Day 11 ~ Creative and Intentional Homeschooling - It's easy to be intentional when the kids are young but when they get older you have to be a bit more creative. Day 12 ~ Homemade Watercolor Paint - This paint is easy to make. The kids loved using a paint that they made themselves. Day 13 ~ Immeasurable Sufficient Grace - We all need grace. Day 14 ~ Taking A Break - Don't feel guilty about taking time off. Day 15 ~ Using Games in Your Homeschool - Games are a great way to reinforce learning. Day 16 ~ When it is Time to Change Things Up - What do you do when you need to change up the routine to keep going? Here are some ideas. Day 17 ~ Bible Memory and Language Skills - We use Bible verses for more than memory. Day 18 ~ Learning on Our Week Off - Just because you aren't "doing school" doesn't mean learning isn't happening. If you write down what everyone did throughout the day, you will be surprised at the learning that has taken place. Day 19 ~ Seeing the Benefit of Rest - After taking a week off to rest I noticed we are so much more productive. Day 20 ~ Oral Reports in Homeschool - The learning that takes place in preparing a report isn't the only benefit. Day 21 ~ Pumpkin Unit Resources - While the traditional month for studying pumpkins is October, we do our study every year in November. Day 22 ~ Finding Rhythm in Your Homeschool - Our rhythm changes with the seasons. Have you discovered your rhythm? Homeschooling is a great adventure, especially in our house. I am always trying to come up with new ideas to keep our learning time fun and exciting. We use textbooks but more often we use unit studies and lapbooks, games and activities, experiments and living books, and the Bible to learn. Here are 31 posts about our homeschool adventure so far. Day 5 - What School Room? Please note that the next links are not technically in the series but earlier posts about homeschooling. They are some of my most popular homeschooling posts. I became so extremely busy that I was unable to keep up with posting during October and after November slipped away in a quick blink I decided that it would be better if I just added these posts to the list. Mommyhood is a place where I have learned so much about myself and about my Lord and Savior. Really God has taught me so much through being a mommy than I can ever have time to write down. Here are just some of the lessons I have learned about being a mommy and about who I am in Christ. I know that without God I would fail miserably at being a mom.